"You really have no understanding of who I am, do you," I asked, patting my lips with the Corellian silk napkin which I had prepared for myself before the meal. "No no, you don't. No one could possibly understand who I am. Of course, except for one man. But he's meeting his end shortly I presume." He would be my third in a month. A man who, until that day, had gone about his life so casually and complacent as to never give a care about anything of any significance. His life and purpose were meaningless - paling in comparison to your's truly's. No, I was a man of great importance and significance. A man with power. A man with contempt for those who cared little for finer things. A man who mattered. I no longer had the patience to deal with him. You would think that in all the time that humans have existed, more than one person in the forsaken galaxy would have learned some manners. Perhaps not. As it would seem, manners were reserved for people of my persuasion - those few who knew the value in presenting one's self appropriately. So as I watched the pathetic imbecile tearing through his food like some kind of alien foreigner, I grew angrier and angrier - seething with fury over his negligence. I awoke from my daze as I usually did - panting to myself in a chair seated next to the victim. His entrails had been spilled across the table and floor before him, splaying him out in the same manner he had taken to his selection of rare meats. His blood dotted my face and fingers, hinting at the sheer rage which had poured from me as I undoubtedly hacked the man to pieces with my dinner knife. So I patted my lips once again. "A terrific meal, don't you think, Mr. - what was your name again? It doesn't matter anymore, I should think. Your family will be wondering where you are. Or do you not have a family," I had no choice but to laugh at my mockery of the man. "A shame. To leave this galaxy with no one to worry about you. Tisk." The rare steak was excellent. Have you ever wondered why humans, among the other disgusting species of this galaxy, betray their fellow humans? They do it for one reason - to see their former ally suffer the effects of humiliation at their own hands. Why then, does it not happen more, I wonder? And so true to my kind, I relish in the delight of humiliating those around me. I would stop at nothing to watch a man fall from grace - to witness the end of life as he knows it. Wouldn't you? Deep down in that burning desire of your's? "Post a new bounty," I seethed. "Two million credits for the fall and public humiliation of New Republic Senator Ktet Samurix. Offer to all Exchange hunters or any of the other pathetic seedlings who need a fix. Throw in a unit of spice for reward. It should get them scrambling." I cut into my rare steak, watching as the bloody juices emerged from the striations. The taste was sublime - a deep and earthy delight to which there was the slightest hint of Aldeeranian mint. And even as I carefully took part in my evening meal, I found myself laughing at what would eventually become the Senator's political end. One should choose their words carefully. Another day had passed. I was feeling saucy and so I had taken to a jaunt through the entertainment district - allowing my eyes to feast upon the trash of society. Any one of them could be my next guest to dinner. But of particular note was a frail-looking woman dressed in a horrible ensemble most likely from a cheap Outer Rim designer. She had certainly caught my eye. "She was quite disgusting, yes," I said to the man seated at my right. The warm and soothing glow of the fireplace cast dark shadows throughout the sitting room. It left me feeling quite revived from the night before. "Although I became much more angered by her insistence on running away. So resorted to more, how do I say, brutish methods?" I indeed had a terribly difficult time with the last one. She turned out to be more trouble than she was worth in the end. A fiasco of sorts. The man calmly returned with a response, offering that perhaps she had displayed more humanity than any of my previous guests. It made perfect sense and so that conversation ended with a long silence. A sip of deep red wine. "Tell me about yourself, Mr. Ryo." I had to admit that the man intrigued me beyond words. Particularly our shared interest for fine foods. His way with words was also very appealing in that he never used fillers and was of the persuasion to decorate his sentences appropriately with wonderful descriptors. And so he responded with a fantastic tale of travels to exotic worlds free from foreigners, pollution, or politics. I found myself further relaxed listening to him speak his story. Indeed, Mr. Ryo would be a delightful conversationalist to have around. Perhaps even a friend. But he had taken to departing before I had the chance to conclude our evening with an invitation to sup the next night as friends. The void left behind in the chair where he had been sitting was interestingly occupied by a mirror - casting my own reflection back at me. A shame I could not show him to the door. "Of course, Inspector. You're more than welcome to have a look around my home if it would please you." I could feel a tick burning deep within me as I gazed across through threshold of the doors. I was stricken by how utterly incompetent the man was. Worthless by all accounts. Had he even the slightest bit of awareness beyond himself, he would have noticed the small spots on my lapel. And to think of the promotion the inspector would have received breaking a case of my degree. Of course, there was no reason why COMPNOR would need to be called to my residence in the first place. I had already taken the appropriate steps to assure I wouldn't be bothered. But it would seem that those I had befriended decided to fall back on their word. "What a shame. Perhaps another time then? Good day, Inspector." I closed the door and returned to the closet in my study. "I must thank you for not troubling me while the inspector was here," I comforted the man, pulling him from the closet by his bound wrists. A chair was already set aside for him in the lounge. I planned an evening of mild banter for the two of us. Gentleman to gentleman talk - a perfect end to a pleasant evening. "It's rare to find someone as well-behaved as you given your situation." Sadly, the man remained silent for the rest of the evening. He had no choice, of course. I had already removed his vocal cords and drained him of most his blood. I admit that I had gotten carried away with that one. Alas, I enjoyed his company nonetheless - a real treat to talk to by measure. Very good with listening, he was. "You can't get away from me," my words echoed through the halls. Not even the large Corellian grandfather clock in the main hall could make itself heard over my roars. Indeed, I was beyond angered at that point, having had to cut our conversation short. "You're going regret every last breath of your measly little life!" I became desperate - not wanting to lose a guest in a manner which I seemed to be. She had slipped away, somehow sensing my intentions. Perhaps she was sensitive to the Force? I could not say. But at that moment, I wanted nothing more than to end her pathetic existence - an insatiable need to punish her for grieving me. The blade in my hand was as hungry for revenge as I was. The haunting reflection taunted me further down the main hall. A whimper in the closet as I passed by. I pulled the door open slowly, revealing her trembling frame behind a few coats reserved for colder days. Her face was remarkably pale. Weak and pathetic. Traits I knew which she embodied from the moment I cast my eyes on her just a day prior. "If you will not cooperate, I'm afraid I have no choice." Some time later, I came too in the bathroom. The tiled and durasteel walls were smeared in crimson swathes. What was left of my guest lay in the marble tub against the far wall. It was filled with blood. A tickle in my stomach bubbled up when I caught sight of the expression on her face. She wanted to live. How sad. It made the trouble worthwhile. "I'm sorry it had to come to this, madam. But my patience had worn thin and I could do nothing to stop myself from the inevitable. You understand, of course." Cleaning the mess would be chore I had not intended for myself that evening. But it appeared that I had no choice but to get my hands dirty. "You're awfully quiet, Mr. Gin." I had picked up a younger man than usual, in his twenties perhaps, who had been wandering around the industrial sector looking for work. Immediately, I recognized him as a slicer - one of those vile techno-types who knew something about getting into places they shouldn't. I cut into the slab of meat on my dinner plate. Juices flowed from within, filling the shallow china with a reddish-brown glaze which was the perfect accent to the roasted potatoes. "Let us start again, shall we? You seem to be a smart lad, am I correct?" He nodded rather sheepishly. My estate must have been alarmingly intimidating for someone who knew nothing about finer decor. It was most probable he had never seen anything like it before in his short life. "I have an offer for you, Mr. Gin. Have you ever heard of the Geonosians? They're an insect species which inhabit the world of Geonosis. Filthy creatures, I assure you, but I am not interested in them. Rather, there is a ship which they construct that I would absolutely love to add to my personal collection." The boy remained respectfully quiet, surprisingly interested in what I had to say. He must have suspected that in the end, there would be the offer of credits. "I would like for you to use your skills to steal one for me." I was met with a less than satisfactory response. "Let me assure you that going to the authorities would be a grave mistake on your part, Mr. Gin. And I particularly do not appreciate that tone of your's. Reexamine your situation carefully." I laughed quietly to myself then took a sip from my glass of wine. "No, I would imagine that given where you are, idle threats would be the true crime here." Never would I have imagined that the boy would then leap from his chair and run from the dining room. It was a shame, really. The boy had promise and would have stood to gain a considerable amount of credits for his effort. Alas, that would not be the case. And so I was forced to once again remove myself from the dinner table - ruining an otherwise perfectly enjoyable evening. "Another mistake, Mr. Gin," I shouted after him, slipping the steak knife into my hands. I hated losing my temper though I hated having to chase a guest through my halls even more. It was brutish behavior fit only for animals. "Your mother is going to be worried sick!" Have you ever wondered why the human body is built with reflexes ingrained before conception? Pain is inevitable and reflexes, then, are obsolete. No matter what I could do to prepare myself, an imminent blow will come. So then is it not arguable that reflexes are another animalistic instinct which stand in the way of man's dominance of lesser beings? Allow me to explain further. The night I invited Mr. Gin over to sup, the boy simply refused to cooperate. He lead me to the foyer where I found him curled up in the fetal position, begging for his life. It pushed me past the point of no return and before I had realized it, I had disemboweled and quartered the boy across the entirety of the floor. He laid there before me, filleted out - his blood soaking into the already-red, imported rugs. Mr. Gin was tense, of course, expecting the final blow. But his body believed that the tightening of the muscles would somehow protect him from harm and possibly save him. But in the end, it made tearing him apart so very much easier than it would have had I not been able to use his bulging musculature as a guide for dissecting him. "My, isn't this a surprise, Mr. Ryo," I exclaimed with a smile as my friend arrived the very next night. "A pleasant surprise indeed. Please come inside. It's frightfully cold out this evening. I'll take your jacket." The two of us engaged in a rather entertaining conversation about the subject matter I had already elaborated to you previous to Mr. Ryo's arrival at the estate. His views were impressive - expressing a disdain for archaic rituals, bodily functions long unnecessary, and the seemingly devolving human species. The more he talked, the more I grew fond of Mr. Ryo. He was the perfect gentleman - well-mannered, well-spoken, and well-dressed. "I'm afraid I must call the evening on account of previous business, Mr. Ryo. I do apologize and hope you will join me again very soon?" Indeed, I was saddened that I had to ask my friend to leave so soon and on such a wonderful evening. There were pressing matters which demanded my full attention. A bounty was being collected. Lately I had taken to long walks at night through the airy leisure districts. My mind was growing restless without a companion to spend evenings. Mr. Ryo's visits had become less frequent, obligating me to spend too many nights alone in front of the fire. My other guests' visits had also become less frequent. Although I enjoyed the occasional visit, I no longer had the desire to put up with their pathetic antics and so had taken to avoiding the usual areas - prohibiting myself from indulging. There were, of course, a few who I had the irresistible urge to invite to the estate for supper. A couple of ladies and one gentleman. A very ill-mannered man who was still seated across from my place at the table. His two-day old, horrified gaze intrigued me. "Now now," I mused, taking a bite of supple steak. "You'll speak when spoken to, Mr. Grand. I will not have one of my guests remaining quiet for all this time. It isn't polite, when I have prepared such a wonderful night for you, to act so primitive. Don't you agree, Mr. Grand?" There was still no response. No matter how terribly I wanted one. It was upon Mr. Ryo's suggestion that I 'get out' that I decided to endeavor into the pinnacles of society - the very streets where the rabble walked. I could not have been more wrong in accepting the advice of my dear friend. Immediately, I felt choked. Suffocating amongst the endless, wretched smells that wafted off the bodies of humans and aliens alike. Everywhere I looked, disgusting, putrid beings from across the desolate galaxy swarmed around me. Like rats in the gutter, they weaved in and out amongst mobs, jaunting to and from places dotted in their meaningless lives. It took every ounce of my being to not lunge out and end the life of the next passer-by. The impulse to kill welled within me, tempting me into actions which I knew were meant for the privacy of my domicile. But even as I calmed myself, I found it increasingly difficult to control my actions. A bumbling human dressed in Imperial throws knocked himself into me and continued on without so much as an apology. Innocent to any wrong-doing, I pulled the man back by his arm, catching his gaze. I had every intention to pull from my pocket the slender blade I had concealed and slice through the fool's bulbous cheeks. It was a mobbed, public square. I let the man go on his way, looking down at my now-filthy hands. If ever there was a moment that someone had escaped from me, the Imperial man who that day committed an act worse than all sin, it was that day. It is interesting to imagine what the galaxy would have been like if it were free from the grasp of the alien swarm. Riddled with filth, disease, poverty, and a decaying sense of morality, the galaxy had become a rotting infestation - an infestation which every functional government had decided to overlook Their refusal only further increased the ongoing decay. "I agree with you completely, My. Ryo," I stated sincerely, brushing my lips with my napkin. "The possibility that exists for this galaxy to climb out of the rot is beyond words and yet no one has stood up to speak out against the throngs and demand change. These governments are just flies helping to spread the disease." The gentleman at the end of the table, who I had come to admire dearly, nodded his response. He also retorted, playing the devil's advocate to amuse the both of us, with a tale derived from the dunes of Tatooine. It was a fantastical story which followed the life of a dune fly and how the tiniest insect could cause the decay of an entire Krayt Dragon, but how other creatures, when allured by the possibility of food, can destroy the carcass and consume the swarm with it. "You always amuse me, Mr. Ryo," I returned with a smile. "Thank you for accepting my invitation to dinner this evening. It has been rather stale around here. I care not for going too long without intelligent conversation. It has been quite the treat." Indeed, our evening was filled with banter through the hours. Stories, ideas, theories, everything I needed to stimulate my mind and pull myself away from angering thoughts. Mr. Ryo was an excellent conversationalist and knew exactly how to deepen my mind. But when I looked up from my glass of wine, seated now in the lounge after my friend had finished his latest tale, he had disappeared - perhaps returning home to reflect on our night's discussion. I did not mind. My thirst for company had been slated. "Do not underestimate me, my friend," I chided the senseless boy across from me. "You will stop making so much noise and remain right where you are." The soft echo of my footsteps upon the Corellian Marble floor were eerily deafening. The boy panted, eyes cast up at me with the same dull and helpless look he had when I picked him up from the space port. All it could possibly accomplish was to further drive me over the edge and past the point of return. My vision had become cloudy, sounds and sights dimmed to bring the focus on the boy's form. It was too late for him, sadly. When the dizzying menagerie of dreams subsided, I found myself sitting comfortably in my chair at the dining room table. Splayed out before me was the boy, ripped open from throat to pelvis, entrails littered the room. Indeed it was one of my more violent and untidy crimes, but having been so long without company or intellectual stimulation, release was sure to be in excess. "Interesting," I mused, noticing a setting made out before me. A plate, silverware, and a meal half-eaten. "You must have been delicious, my friend. Quite the serving here. Perhaps I will save some for later." The red-soaked napkin did little to wipe the stale blood from my lips. Nothing, it appeared, had been spared from the thrashes of blood as I undoubtedly shredded the boy to pieces while he was still kicking for life. "I most certainly will have to." "Have you heard of a system called Ziost," I asked, sharpening a set of cutlery as I leaned against the back of my chair. "I'm told there is a derelict station there which hides many secrets. If my sources are correct, and they always are, there was an accident and everyone simply left. I wonder." My tone and expression implied the faintest yearning. To even the most malleable mind, the suggestion would have been enough to warrant questions until the nagging little itch at the back of their mind was scratched. Only after learning all they could and until all the secrets had been revealed could their great curiosity be sated. Perhaps I needed a reaction; to see in my guest's face the surprise, delight, or impatience such news could bring. To my great disdain, the boy said nothing. Those who had not even reached their teens were most likely too young to understand the true allure of adventure it seemed. With a mildly annoyed sigh, I set my pair of knives flat against the silk, red tablecloth. For a moment I gazed across the table at the budding young man, having the sense that I may have been treading a fine line. Never before had I entertained such a young soul. However, even as I felt that nagging doubt, I reminded myself that all people are created equal. Or so I had been led to believe. "Do you like sweets, Lucious?" I produced a box of fine Coruscani chocolates for the boy. As a child I was quite fond of the caffeinated delight myself. "Please. Do help yourself." The rain consumed the scene, the estate echoed with distant thunder, and screamed of eerie intrigue as lightning flashed across the skies. Her speeders pulled up against Bounto's Estate, her calm demeanor resting across her face, in such a way, that it was like she wasn't even here. And mentally, she wasn't. The X-Wing fired up its engines, the astro droid beeped with urgent enthusiasm. It was more than happy to get underway, the Imperial Walkers in the distance, had succeeded in destroying the shield generator. Echo Base had been breached, and Vader himself, was rumored to be inside. "R6, get us out of here." The droid slammed on the accelerator, the snow disappearing behind them, becoming clouds, then stars. A Star Destroyer was pre-occupied with a fleeing transport, to notice her. And before the nearby TIE fighters had locked onto her, she had gone to hyperspace. Bespin. Coruscant rumbled, the skies screaming in rarely seen natural ferocity. Arlyn's fingers touched the pin pad key, and without hesitation, it opened. "Welcome, Augustus." No one in the galaxy would never guess the Chief of Alliance Security, was in fact, Second in Command of the galaxy's leading criminal organization. Perhaps, they never would. The doors opened, and the stench of flesh, and blood filled her nostrils. In a strange manner, she had predicted this, she had sensed this would be it. The man Nubis had been, was no longer there, and she sensed the evil. The ysalamiri crawled inside, most likely, happy to be out of the bad weather. "Serin," Arlyn sounded out of the corner of the room, her steps echoing against the large rooms. 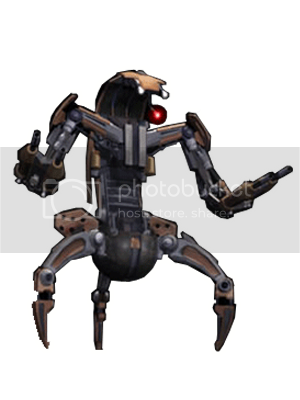 Six guards entered the room next, their weapons dripping with water, and shortly after, modified droidekas entered. Three dozen spread throughout the Estate, their weapons locking on to the man, who was elegantly sitting at the table. "Alat�ri�l, what a pleasant surprise. Have you come to join me for dinner?" A menace that long preyed over the galaxy, in the shadows of the criminal underworld rose from his chair, a blood-dripping grin welcomed his uninvited guests. Cyrus Bounto, also formally known as Nubis Serin, welcomed them as though they had been expected. "Lady Arlyn," his pleasantries was formal, but she could tell he was caught entirely off his typical guard, "What a pleasant entrance,"
Her fingers removed the blaster from her side, stepping closer and closer, as she aimed at the delicate spot between the man's eyes. "I see Leia failed to remove the demon," her eyes narrowed, placing the small cross-hair into its most fatal position. As she stepped closer, her stomach convulsed at the image before her. A small children was sprawled out as though being served like a Life Day turkey. His hands were chained, restrained against the delicate feast, in a perverted elegant manner. The boy's eyes pleaded with the angel before him, begging her to undo the damage that would forever scar him. "You are a monster," she whispered, unable to speak the words that would be able to condemn him. His grin only increased at the thought, but quickly turned into a hiss as Arlyn released the boy. "Take the boy to a speeder, and get him out of here." Two droidekas, and a bounty hunter complied. Escorting the petrified child from the room, Cyrus narrowed his eyes. "I did not-"
"Nubis, shut up." Her voice was loud enough to set the scene into her control, yet the words that followed would echo and spread as though she was speaking to a much larger audience, than just him. "My name is Alat�ri�l Pallan�n-Davad, a child of Thanagar, an agent of the early Rebellion, Assistant of the Democratic Emperor and Senate of the DRWP, leader of the Lambda Corporation and Turbinia Inc. I am a goddess of the Geonosians, and leader of the Zerconian Super Hive. "I was the Ang de Geo, the Chosen One of Rambaldi's Prophecy that had been foreseen thousands of years ago. I was the god-niece of Lucious Victorinox, one of the most prominent figures of the galaxy. "I am patron of the Bounty Hunter's Guild, served as the Chief of Alliance Security, and honorary member of the Jedi Order. I have contributed, and produced marvels of artificial intelligence beyond comprehension. "On behalf of all of the above, I hereby place you arrest, in league with the Rebellion, the Government of Coronus, Geonosis, Manaan, and Hypori. On behalf of the Galactic Empire, the Democratically Represented Worlds Protectorate, the people of Nespis, Devoran, and the Ssi-Ruuvi Cluster. "By trial of Geonosis, Manaan, Hypori, and the Ssi-Ruuvi Empire, you have been found guilty. The charges are many, and specific," she removed a data padd and tossed it at his feet, "On such grounds, you have been sentenced to exile, or execution, determined by a Grand Jury. "The Grand Jury consisting of Ryan Davad of Coronus, Trisk Bon'Varlo of Bothawui, Tiik'a'tree of Manaan, Kreikas of Geonosis, and Tin Tin Poola of Hypori, has chosen the punishment of Execution." Arlyn paused, as the droids rolled out and their blasters aimed at the man. "Despite these allegations, and punishments, you have also been found guilty on a deeper level. Treason to the Illuminati," Arlyn's eyes narrowed, "As Second in Command, formally as Augustus of the elite, I have also found you guilty on all accounts. Members such as Carnor Jax, Ams Jendob, and Boba Fett, though unreached, have been terminated as members. Their duties to our cause, have been released and will forever remain a secret." "On an even deeper note, Serin, you have been found guilty, as a friend. You betrayed my confidence by setting kidnap, and murder charges against my husband, and the father of my children." Arlyn's fingers tightened across her blaster, as the man seemed to be searching for something. "You have been stripped as a civilian, as leader of the Illuminati, and now, the leader of the Exchange. I will take your place, and forever, keep the galaxy safe. You have lost a true friend, a true warrior, and a true confident. "We have found labs with your DNA, and memory, and had them purged. You will not resurface biologically, and with the ysalamiri around you, you will not be able to leave this body with the Force. "Cyrus Bounto. Nubis Serin, and whatever demon claims his body," her fingers squeezed the trigger, as the blast shot from the barrel of the gun, she spoke the final words he would ever hear, "You end now, forever." He had been the Lady's protector for nearly five years, designed by Calias Ketra, as her ultimate guardian. He had served with her for a multitude of missions, and saved her in every single one. His cannons were locked, and charging as her blast bolt charged across the room and splattered the humanoid's brains across the backwall. On que, Artemis opened fire and with his companion droids, completely obliterating any and all remains of Nubis Serin. As she exited the building, flanked by a bounty hunter, and a ysalamiri creature, the droideka flickered as the legendary woman touched his processors from afar. Good work, she whispered from her domain, and he relished in this achievement. For five years, Artemis had informed the Lady of anything and everything he had witnessed. But this connection, was a secret. A protocol he could not disobey. As he dropped the charges strategically throughout the estate, rolling from one place to another, Artemis understood that this was for her benefit. In time, all secrets would be revealed. As the speeders pulled away in perfection synchronization, Artemis activated the charges. In a superheat phenomenon, Serin's estate roared into extinction. Anything biological was fried in the first three seconds, leaving no DNA, no matter, or any possible cloning variable. In a flash, the galaxy would never see Mr. Serin again.